Nikon | Imaging Products | Best of the Rest / Nikon Family Cousins, Part 3 : "NIKKOREX F"
Home > Products & Support > Imaging Products > History > Camera Chronicle > Part 3 : "NIKKOREX F"
Part 3 : "NIKKOREX F"
The brand name "NIKKOREX" was used for 8 mm movie cameras as well as three lens-shutter type SLR cameras (NIKKOREX 35, 35 II and NIKKOREX Zoom35). 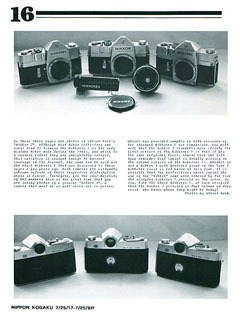 Among these "NIKKOREX" cameras, the top-of-the-line model was the NIKKOREX F which was a focal plane shutter SLR camera that has the same bayonet lens mount as the Nikon F.
This NIKKOREX F first appeared in June of 1962 at a price of 39,800- Japanese yen, including 50mm f/2 lens. Another camera of the day, the Asahi Pentax S3, for example, sold for 34,100- Japanese yen, including 55mm f/1.8 lens. The NIKKOREX F was therefore a little more expensive than the Pentax, but much less expensive than the Nikon F with the same 50mm f/2 lens, which sold for 67,000- Japanese yen. Why did Nippon Kogaku K. K. decide to release such an inexpensive SLR camera ? The answer was to expand market sales of the Nikkor lenses. The Nikkor 200mm f/4 and telephoto zoom lenses (Auto-Nikkor Telephoto Zoom 85mm f/4 - 250mm f/4.5) were released starting 1961. In 1962, the PC-Nikkor lens, the Fisheye-Nikkor, and other unique lenses made their debut, thus starting to construct the great world of the Nikkor lenses. The company wanted to expand sales of these interchangeable lenses and make its SLR camera business an established one in which the lineup would become a rich, steady revenue source. Thus, the company saw the need to sell Nikkor lenses to people other than those professionals and advanced amateurs who were most likely to use the Nikon F.
The NIKKOREX F actually was created, from development to production, by another camera maker, which we'll refer to as "M". Whether Nippon Kogaku K. K. approached "M" about the arrangement, or vice-versa, it is not clear. Anyway, the NIKKOREX F was in the final stage of development when both participants met. And the only thing left to do was to modify the lens mount and the automatic diaphragm mechanism to fit the Nikkor lens. It is said that, Mr. Joseph EHRENREICH, a major figure in popularizing Japanese cameras in the United States, was also involved in this project. As a major importer of the Nikon products, Mr. Ehrenreich had strong influence on product planning of Nippon Kogaku K. K.
He also dealt with importing "M" products to the U.S. market. So, it is likely that he insisted on the need for Nippon Kogaku K. K. to come up with an inexpensive camera body to expand the sales of the Nikkor lenses, and took a role of intermediary for Nippon Kogaku K.K. and "M", thus planting the seeds for developing the NIKKOREX F. However, this is only the author's conjecture assembled from hearings of participants, and there is no way to make it certain. The NIKKOREX F was equipped with Copal Square : Type I, which is a unit-type focal plane shutter with vertically-traveling metal blade. This epoch-making shutter unit was being developed by the Copal Co. Ltd. around 1960, under the support of three (3) camera makers who were supposed to receive exclusive supply of this unit by contract. "M" was one of the three, while Nippon Kogaku K. K. was not. This fact brought the NIKKOREX F unexpected honor of "the first camera to use Copal Square : Type I". The Konica FS, which also used this mechanism, later evolved into "FP" and "FM". But the NIKKOREX F bore no descendant. For further details, refer to the "Camera Review" magazine : 2nd Issue (1978) article "Metal Shutter Progress Part 1 : History" by Mr. Hisashi MITSUOKA. While developing the NIKKOREX F, Nippon Kogaku K. K. encountered and experienced totally different culture just as in the case of NIKKOREX 35. You see a lot of traces of challenging cost reduction method on this camera, which was never seen with the Nikon F.
As mentioned in the previous chapter, the cameras with "NIKKOREX" brand name had not been commercially successful including the NIKKOREX F.
However, many methods employed for producing these inexpensive and high-quality cameras applied to the development of the successors such as the Nikomat ("Nikkormat") series and so on, resulting in the big success. For example, the lens-release button of the camera with the Nikon F mount is usually positioned just on the right side of the lens mount when facing to the camera body. The position of the lens-release button of the NIKKOREX F is exceptionally at the lower right side of the lens mount (See photo) since a leaf spring is installed for the button's recoil spring. While the one side of the leaf spring is fixed on the upper right side of the lens mount, the lens-release button is positioned on the other side of the plate spring and the lock-pin is firmly installed in the middle. Thus it was possible to reduce the mechanical parts and simplify the assembly, compared to the mechanisms using regular coil spring. Usually, the cable-release-screw of the shutter button should be tapered, however, the screw of the NIKKOREX F is straight for cost reduction. Such techniques to reduce production costs are noticeable everywhere. However, I wonder why the film indicator is equipped on the center of the camera back, which requires high assembly costs. Was a film indicator valuable for users in these days ? However, "Version 2" mentioned below does not have this film indicator. Although the production span of the NIKKOREX F was relatively short and thus the production quantity was not so many, a few variations exist. Quite a small quantity of balck body model were produced. Even someone who worked in the product development is not sure if the black body model was really produced. We could trace it because Mr. "K" (right photo) who owns one showed it to us. The camera was exported to Germany under the name of "NIKKOR J" instead of "NIKKOREX F". 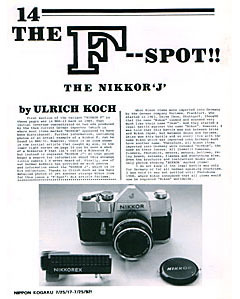 This camera was introduced by Mr. Ulrich KOCH, a German collector, in a bulletin of the "Nikon Historical Society", which is the group of Nikon camera collectors. The later version ("Version 2") has re-designed film-winding lever, self-timer lever, rewinding knob and shutter dial. Also it omitted film indicator as mentioned above. The worker at that time remembers the design change of some exterior parts (to resemble those of the Nikon F of the day) to enhance the sales. However, the black body model and "NIKKOR J" introduced here are all of the "Version 1" type. Did "Version 2" actually exist ? This hasn't been confirmed as yet. 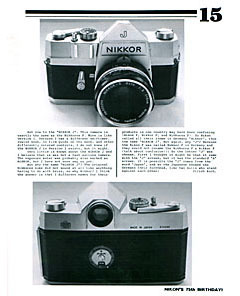 This issue first appeared in "Nikkor Club Quarterly" magazine , published by the Nikkor Club, and was later revised for "Camera Review : Classic Cameras" published by Asahi Sonorama. It was re-revised for Nikon's webpage.